Researchers from the University of Texas at Arlington have developed a micro-windmill that can generate wind energy despite being just one-tenth the size of a grain of rice, making it an innovative way to power cell phones or other technological devices without the need for large turbines. According to Forbes Contributor William Pentland, graduate research associate Smitha Rao and electrical engineering professor JC Chiao used recent advances in micro-robotic devices in order to develop the micro-windmills, which can use ambient wind in order to generate electric power. The turbines are 1.8 millimeters at their widest point, and hundreds of them could be embedded on a cell phone sleeve in order to charge the device’s battery by waving it in the air or exposing it to wind through an open window. The windmills “blend origami concepts into conventional wafer-scale semiconductor device layouts so complex 3D moveable mechanical structures can be self-assembled from two-dimensional metal pieces utilizing planar multilayer electroplating techniques,” the university explained. Rao’s work in micro-robotic devices caught the attention of WinMEMS Technologies, a Taiwanese fabrication firm that manufactures micro-electrical-mechanical-system (MEMS) devices. The researchers said the company was intrigued by a demo video of the technology, and has agreed to commercially produce the micro-turbines. “These inventions are essential to build micro-robots that can be used as surgical tools, sensing machines to explore disaster zones or manufacturing tools to assemble micro-machines,” the university said. Rao called it “gratifying to first be noticed by an international company and second to work on something like this where you can see immediately how it might be used. 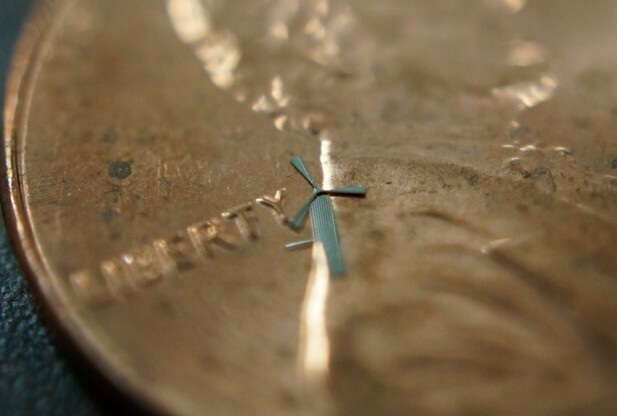 However, I think we’ve only scratched the surface on how these micro-windmills might be used.” She added that while most MEMS designs use materials that are “too brittle,” their turbines avoid that potential pitfall by using a durable, flexible nickel alloy. Under the terms of their agreement with WinMEMS, UT Arlington will retain intellectual property rights to the technology while the Taiwanese firm explores opportunities to market the turbines. The university has applied for a provisional patent, while WinMEMS has been promoting the micro-windmills, as well as gears, inductors and other components that can be used to build miniature robots, on its official website.